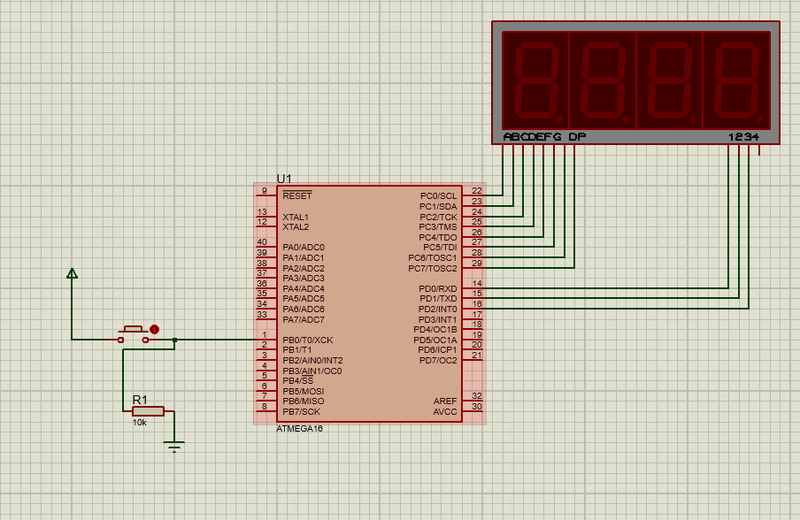 I just got into Timer/counter programming, and i'm trying to make a counter circuit using atmega16 and 7-segment. but i reached to a point where the counting on 7-segment displays doesn't go well. Can anyone please tell me where is my mistakes? What do you mean by ‘doesn’t go well’? like the first digit counts to 9 then it is starts again from 0 till it reaches 9 again then 0 then the next digit becomes 8 and it stays like that for ever. What have you done to narrow down the problem? i'm still trying to modify the code. I wrote the right code, thank you for you interests. I just changed the delay time form 1ms to 10ms and it worked properly. but i still don't know what is the explanation. How fast can the human eye see and interpret what is displayed? Updating 300 times per second is beyond what the human can decode. 30 times per second is more likely. Stop opening more threads asking the same question!